What would be a good way to thumbnail audio? I want to represent an audio file in an image with a maximum size of 180×180 pixels. I wonder if any of you have something for this. I have been searching around for a bit, mainly audio visualization and audio thumbnailing, but I have not found anything useful. Good question. In terms of UX there are a few different things you want in a thumbnail. Ideally the thumbnail should be memorable, though how to do this with sound I have no idea. Finally you want all of this to be clear on your 180x180 thumbnail. Doing this well will doubtless be very challenging. Map the default hue to a mixture of some or all of the items in 2 above, this should give you similar color files for groups of files. What about taking a waveform resolved to stretch only a short distance, say 200px, then wrap it around a ring so it fits inside the square thumbnail constraints. So... length of waveform graph would be... related to pi somewhat. Like this, which I made in photoshop using the polar coordinates command. 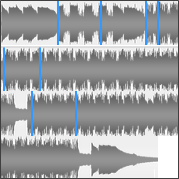 A smooshed-up waveform doesn't seem very useful. For all practical purposes it's meaningless, and it'd be hard to tell two 180x180px waveforms apart at a glance. Instead you might consider a visual hash like Identicon. That would still be meaningless, but the thumbnails would be visually distinct. A clever algorithm could even make similar files (e.g. 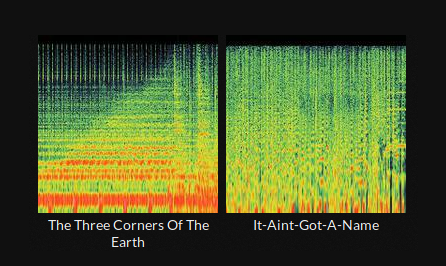 songs from the same album, or from the same artist) visually similar. Digging around on Don Park's blog a bit turned up Frederic Brodbeck's Cinemetrics project, which may be useful. It's a visual hash intended for films that you might be able to adapt for use on audio. I didn't understand whether by "chopping and stretching" you meant taking a segment of the audio data and stretching it so it fills the square, or rearranging it. The rearranging approach sounds like a good idea. Thumbnails are meant as a preview for identifying the object without getting into the details. Using the wave form in a thumbnail would not help identify the audio track. Use a visual representation of the contents e.g. use a database or pre-identified and tagged soundtracks or use audio recognition. Once you have identified the elements of the contents you could include small thumbnails that represent those elements in one bigger thumbnail. E.g. a thumbnail containing a picture of the singer, a guitar or a picture of a train if the soundtrack is a sample of the noise a train makes. You might be knowing this already , this might work with the song name in center of the image or below. The solution I settled for was to use Freesound's spectrogram generation code, then applying the Wadsworth Constant to the position for the thumbnailing. 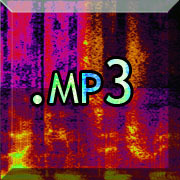 This gives you a snapshot of the audio clip with the center at 33% into the audio clip. The code for the process can be found at mediagoblin.media_types.audio.transcoders.py, line #99. I will not mark any answer as correct, since none of them, not even mine is universally correct. Along the lines of @Forthright's answer, I think mapping the volume intensity to a gradient (colour/grayscale) and plotting along a Hilbert curve could be interesting. This would be similar to http://corte.si/posts/code/hilbert/portrait/index.html and would provide a rectangular icon that gives an impression of the sound patterns that would be distinct for different files and scale to any length of audio and any icon dimensions. Not the answer you're looking for? Browse other questions tagged icons info-visualisation audio or ask your own question. What are good reasons for and against using audio for feedback? Is User Triggered Background Audio Acceptable? Difference in audio level for speaker and headphone? What is a good way to word the warning 'audio device not found'? For what reasons would you not include a volume control in an audio player?